Thinkbox, the marketing body for commercial TV in the UK, claims that television accounted for 94.6% of video advertising last year, despite an ongoing shift in viewing habits. According Thinkbox’s analysis, which is based on data from sources like comScore and the IPA, TV ad revenues showed “remarkable stability” with 2018’s share of the video ad market down only slightly from 95% in 2017. Thinkbox estimates that people in the UK watch 4 hours and 41 minutes of video a day, with broadcaster TV services accounting for 69% of this – down 2% compared to 2017, thanks mainly to increased viewing of SVOD services. 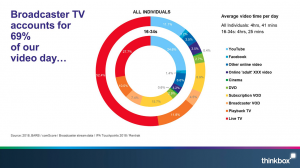 According to the stats, viewing of TV content breaks down to: 52.4% live TV (down from 55.7% in 2017); 11.8% playback TV that was recorded and watched later (up from 11.2%); and 4.5% broadcaster VOD (up from 3.8%). However, among 16-34 year-olds, Thinkbox conceded that TV accounts for just 45.1% of all video viewing, down from 50.1% in 2017. People in this age group were found to spend 7.4% of their total video time on broadcast VOD last year, 15.7% on SVOD and 24.6% on YouTube. Across the population as a whole, Thinkbox estimates that YouTube accounts for 11.1% of video viewing, SVOD for 8.9%, adult content for 3.5% and Facebook for just 1.4% of viewing. “While TV viewing is certainly changing, it is hard to ignore TV’s continued pre-eminence in the overall video advertising landscape,” Thinkbox concluded. Thinkbox is the marketing body for commercial TV in the UK. Its shareholders are Channel 4, ITV, Sky Media, Turner Broadcasting and UKTV. Discovery Networks UK and Ireland and STV also give direct financial support. Associate Members are Discovery Networks Norway, Disney, TAM Ireland, Think TV (Australia), Thinktv (Canada), TVN Media (Poland), TV Globo (Brazil), TV 2 (Norway), TV 2 (Denmark), DSTv (South Africa), and Virgin Media. For more information on the research, click here.